Hey Ghost Administrator, It’s MY Computer! You click into the Settings area on your Windows 10 computer, attempt to make a change to one of the settings… Suddenly it appears as if a mysterious organization is controlling what you can and cannot do on your system. The good news is that you have not been hacked. But wait a minute, Microsoft, this is MY computer! This error message appears most often when users try to tweak privacy, security, or Windows Update settings. It happens because of certain bugs in Windows that allow settings to be changed inadvertently in a way that appears to be done by the Group Policy Manager, a hypothetical person who holds authority over policies via the Group Policy management app built into Windows. Group policies are designed for organizations in which an IT manager wants to impose restrictions on all users or certain classes of users. 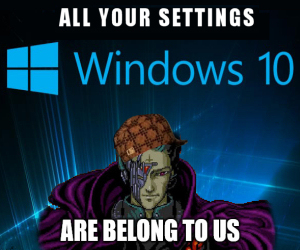 You may have gotten a hint of group policy during the setup of your Windows 10 installation, if you were asked “Who owns this PC?” with you or your (non-existent) organization as the choices. Choosing “your organization” may limit your ability to make changes to policies later. But there is a way to reconfigure Windows 10 to eliminate this restriction upon your godlike power over all that lies on your hard drive. It is called the Group Policy Editor. NOTE: If you have the “Home” edition of Windows 10, Group Policy Editor is not installed. See this page for a tutorial on how to add it to your Windows 10 Home Edition system. In the Group Policy Editor, navigate the tree of options on the left side of the window to Computer Configuration > Administrative Templates > Windows Components > Data Collection and Preview Builds. With Data Collection and Preview Builds selected, you will see the option “Allow Telemetry” over on the right side of the screen. Many pundits, including me, have advised users to disable telemetry to various degrees in order to limit what Microsoft can learn about what you do on your computer. The act of limiting Microsoft’s access to your data may have triggered the “Some Settings Are Managed By Your Organization” problem. So let’s fix it! 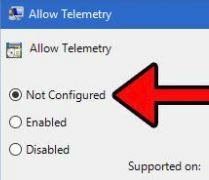 Double-click on “Allow Telemetry” to display its options. At the top of the window, click “Enabled.” Then click the drop-down menu item in the Options section and choose option 3 – Full. Click OK to save the changes and close the window. Go back to the setting where you saw “Some Settings Are Managed By Your Organization” and you should not see that message anymore. Full access to your Windows 10 settings should be restored. This fix works on machines configured as home or personally-owned computers. If your machine was originally set up as an organization’s machine (or your computer really is part of a network that’s managed by your school or employer’s IT department) then this fix may not work. This post is greatly appreciated Bob R without it I would have still been lost.